I guess you could say I got an early visit from Santa this year. Last week, just as I was getting ready to begin my pre-holiday funk, a big dose of holiday spirit came to the Coalition. Standing at the elevator, I ran into a little girl carrying in two bags bigger than herself full of toys and wearing a smile that would have changed Ebenezer Scrooge. She dropped the bags by the elevator and joyfully skipped out the back door. I followed her and found that she and her mother were unloading an SUV full of presents to donate to the Coalition’s annual toy drive for homeless kids. I introduced myself to her mother and asked about this little girl. The mother told me that the young lady’s name is Francesca and that donating toys to the Coalition has become a tradition for her family. When Francesca was only seven years old and the conversation at her house turned to Santa Claus, Francesca didn’t ask if there was a Santa Claus, if she should wait up for him or if he would bring her the latest Xbox game. Francesca asked, “How does Santa Claus find homeless children?” Her mother tried to explain, but Francesca didn’t like what she heard, so she saved her money and came up with $100. Her parents were so impressed, they matched it. Then she and her mom did some research and found out about the Coalition’s toy drive. 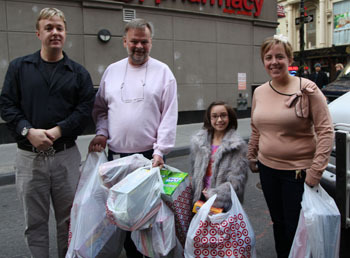 They planned a special shopping trip where she picked out dozens of presents for the Coalition to give to children in homeless shelters. This year she upped her efforts and started a website, and with the help of friends and family, she raised $800! She must be a very savvy shopper because every inch of the SUV was packed with wonderful toys: Barbies, footballs, legos, scooters. She had it all. I have always loved the holidays, but as the Shelter Specialist for the Coalition for the Homeless, I spend my winter days and nights in the shelters trying to make sure that conditions are tolerable and help people better their situation while navigating a broken, punitive and uncaring system. It can be a very frustrating and depressing job, and takes away a lot of the shine of this time of year. But as bad as I may have it, I know first hand even less holiday cheer makes its way to the 41,000 homeless people living in that nightmare system. Then, people like Francesca give me hope. After she left, I couldn’t stop thinking about her. She made me remember that at the Coalition, with the help of our friends, we do make a difference. So the point of all this is the answer to Francesca’s unasked question. “Yes, Francesca, there is a Santa Claus.” I have seen him. He lives in the eyes and heart of a little girl. Learn about the Coalition’s Toy Drive here or simply make a donation by clicking here.